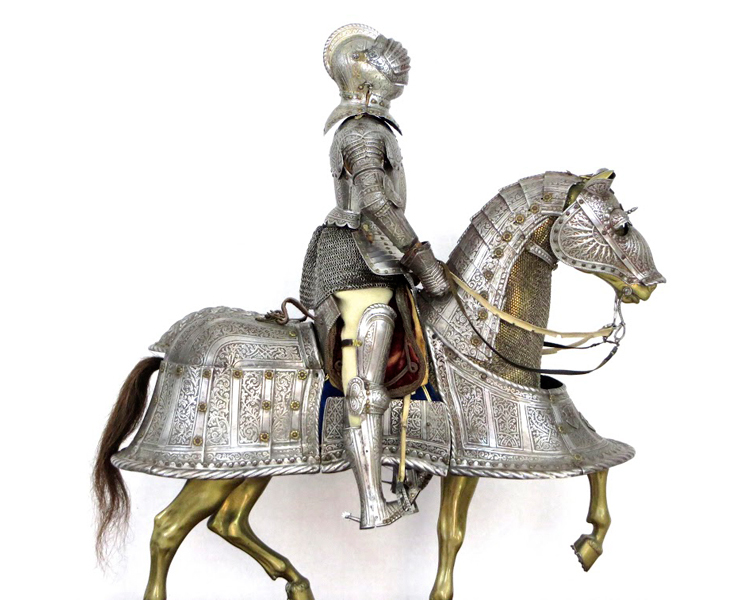 An Important Miniature Armor For Man And Horse, by E. Granger, Paris, 19th c.
Exceptional quality armor in mid 16th century style attributed to E. Granger, Paris, mid 19th century. Accurately modeled and articulated throughout, comprising close helmet with pivoted "bellows" visor, bevor, breast- plate, tassets, back-plate, full arm defenses, including gauntlets and leg defenses with broad-toed sabatons and rowel spurs. The coat made from fine mail. The horse with full body armor, consisting of a chanfron, crinet, petrayl, decorated with coats-of-arms, crupper and leather covered saddle with velvet saddle cloth edged in bullion. All parts etched, except for tassets, and with much gilding remaining in the recesses. The horseman mounted on a wooden mannequin with face made from gilt bronze. The horse made from bronze with iron horseshoes and tail made from real hair. E. Granger was a pupil of the Ecole Royales des Arts in Chalons and worked in Paris from circa 1820 on. From 1840 his workshop was located in the Rue de Bondy 70 (now Rue Rene Boulanger). His miniature armors were exhibited at the Exposition des Produits de l'industrie Francaise 1844 in Paris and the International Exhibition on Industry and Art 1862 in London. Cf. Nickel, Helmut " The Little Knights of the Living-room Table" in The Metropolitan Museum of Art Bulletin, vol. XXV, no. 4 December 1966, p. 182, fig. 27.